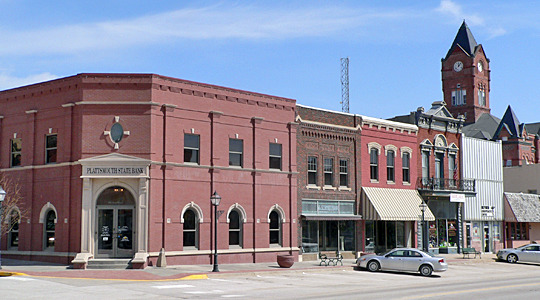 Plattsmouth City Hall is located at 136 North 5th Street, Plattsmouth, NE 68048; phone: 402-296-3600. Photo: 400 Block of Main Street, Main Street Historic District, Plattsmouth, NE. Photographed in March, 2010 by Ammodramus (wikipedia username), en.wikipedia.org, accessed April, 2012. Established in 1854, Plattsmouth might have declined along with the Missouri River steamboat, but the replacement transportation technology, the railroad, ensured its continued development. By 1870 the Burlington Railroad had established its repair shops here, and population and prosperity increased accordingly. By 1892 population stood at 10,000, and the community had not one, but three rail lines serving it. Increased settlement occurred throughout the county and, with it, calls for a more centrally located county seat. Repeated elections and law suits relating to the county seat location were the norm in the late 1880s in Cass County. A 1948 account characterized it as "charge and counter-charge, crimination and re-crimination!" The Plattsmouth forces countered opposition efforts by securing passage of a bond issue for a new, courthouse. They hoped that a new and costly courthouse would lessen the chance that the county seat would be moved. Barbara Beving Long, consultant, Four Mile Research Company, Cass County Courthouse, Cass County, NE, nomination document, 1989, National Park Service, National Register of Historic Places, Washington, D.C.